Looking to take your home to the next level of beauty and design? Then look no further, with our Graphic Stripe collection. 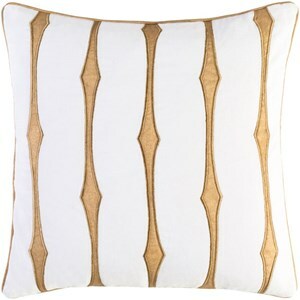 These absolutly gorgeous pillows are made by Artisans in India with the idea of cutting edge style and design in mind. 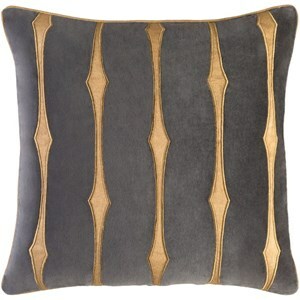 These pillows are made with 100% cotton velvet, front and back. Piped edge lining, and hand woven. Comes in two colors. You absolutely cannot go wrong with these pillows! Spot clean only. The Graphic Stripe 18 x 18 x 0.25 Pillow Cover by Surya at Hudson's Furniture in the Tampa, St Petersburg, Orlando, Ormond Beach & Sarasota Florida area. Product availability may vary. Contact us for the most current availability on this product. Browse other items in the Graphic Stripe collection from Hudson's Furniture in the Tampa, St Petersburg, Orlando, Ormond Beach & Sarasota Florida area.